Union Minister of State for Home Affairs, Kiren Rijiju has reviewed the status of implementation of various Centrally Sponsored Schemes ( CSS ) through Video Conferencing with the Deputy Commissioners of his home constituency, Arunachal West Parliamentary Constituency under District Development Coordination and Monitoring Committee which is also known as “DISHA” today. He took the status of the implementations of CSS schemes like Mahatma Gandhi National Rural Employment Guarantee Scheme, National Health Mission, Mid-Day Meal Scheme, Sarva Siksha Abhiyan and Prime Minister’s Flagship Programmes like Pradhan Mantri UJJWALA Yojana (PMUY) – LPG Connection to BPL families, etc. While reviewing the physical and financial status of MGNREGS, Rijiju called for quality and timely implementations of the schemes in the State. He said that the amount of allocation of fund for next instalments/next year will depend on the success or failure of the implementation of the schemes in the previous year. He strongly said that the flow of fund should not be discontinued due to non-implementations of the Scheme in any part of the State. He further suggested to create visible assets and also to take up livelihood activities like fish ponds, etc which would help to increase the income of the farmers. He urged the Deputy Commissioners and the Panchayat Members to physically inspect the assets created under MGNREGS and to see that the assets developed comes into public utility. Under NHM, he reviewed the status of beneficiaries under Janani Suraksha Yojana, Dulari Scheme, School Health Mission and implementations of Mission IndraDhanush in the districts. He also took the status of number of doctors posted in the districts and the running conditions and utilization of the ambulance donated by him through his own sources in various districts under his constituency. He also enquired about the functioning of the donated modern medical equipments and the availability of technicians to run them in these districts. On the implementation of MDM Scheme, he asked the DCs to ensure quality of food and to see that hygiene of the kitchen shed is maintained and further suggested them to include nutritious ingredients in their food. He also enquired about literacy rates and teachers : student ratio of the districts. He further asked the DCs to conduct joint inspection of the hospitals and schools with the departmental officers from time to time to ensure its implementation and also urged them to arrest the school drop outs. Regarding SSA teachers, he said that the issue of regularization of SSA teachers was already taken up with the Ministry of Human Resource Development and the State Chief Minister in phase wise manner. He asked the DCs and DDSEs to assure that the teachers are present and performing their duties in their place of postings. He also enquired about the number of beneficiaries that received free LPG connection under PMUY and assured to take up with the Petroleum Ministry to increase allocations under this scheme in the State. He also enquired about the numbers of account opened under Pradhan Mantri Jhan Dhan Yojana and the percentage of Adhaar Seeding achieved so far. He also took the status of Swachh Bharat Abhiyan in the districts. He stated that there will be no compromise on quality of works and urged the Deputy Commissioners to properly monitor and supervise the implementations of Centrally Sponsored Schemes for quality implementation. 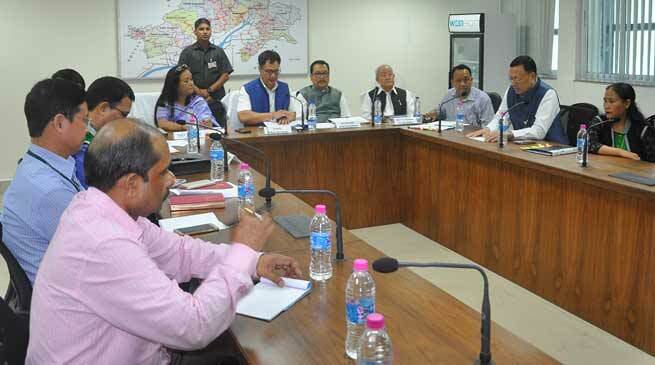 MoS (Home) reviewed the status of CCS implementations with the Deputy Commissioners of 7 districts namely, Tawang, West Kameng, East Kameng, Upper Subansiri, West Siang, Papumpare and Capital Complex and could not connect with DC Lower Subansiri and Kraa-Dadi due to poor networks. Review Meeting through Video Conferencing was conducted along with Deputy Chief Minister, Chowna Mein, Speaker T N Thongdok, Parliamentary Secretary Karya Bagang, Chairman APEDA, Jarkar Gamlin, MLA Tamar Murtem, Chief Secretary, Shakuntala D Gamlin and Planning Secretary, Dr Joram Beda.